NEW YORK CITY, NEW YORK (The Nil Admirari) - Republican presidential candidate and billionaire Donald Trump met his "Uncle Bobby" at John F. Kennedy International Airport at 12:30 this morning. 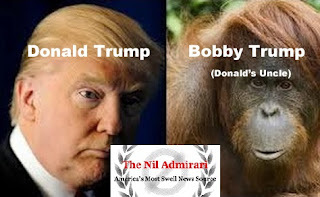 Trump flew his uncle in from Sumatra to help with his presidential campaign, and Uncle Bobby arrived with a large entourage of conservationists and primatologists, as well as large boxes full of fruit, bird eggs, bark, leaves, honey, shoots, and insects from home. "My Uncle Bobby is the smartest man in my family. When I told him I was running for president he offered to help me with my campaign, because he is a totally classy and fabulous guy. So I flew him out as soon as possible from his home in the Sumatran rainforest," stated Trump, who shook the hand of the Sumatran orangutan at his left. Trump added, "I totally stole his suave hair styling, and he taught me how to manufacture and use crude tools when I was a kid. He's great, and definitely better than those clowns and losers I am running against." TNA spoke to one of Uncle Bobby's primatologists and learned Trump's uncle required a lot of time on his own for silent contemplation, and exercised regularly by utilizing tree branches. An almost jovial Trump did not seem to worry about Uncle Bobby's busy schedule and stated, "I can't wait to get him back to my place. He'll have some very major and critical things to contribute that will help me beat those stupid primates I am running against."